Known as the home of the original oriental carpet, Iran (Persia) the oldest and once most powerful empire in the Middle East, stood at the crossroads of Eastern and Western civilizations. Under the Safavid Dynasty (1502-1736), Iran attained its artistic height. Court weaving, together with the arts of calligraphy, miniature painting, and tile work, flourished to exceptional heights. This brilliant era witnessed the development of highly qualified carpet factories in the cities of Kerman, Isfahan, Kashan, Tabriz, and Herat. Iran is the genesis of most motifs, patterns and traditional colorations produced in rugs throughout the world today. Over the centuries, Persian carpets have become treasured heirlooms passed on from one generation to the next. 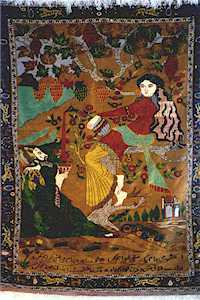 Persian carpet exports began in the 16th century. Starting in the 1850s, American, English and German firms established new factories in Mashed, Tabriz, Kerman, and Sultanabad (now Arak), thereby ensuring the art form’s continued development. Under Reza Shah Pahlavi, royal factories were established to utilize the finest materials and methods of manufacture. Persian carpets and rugs have always been and still are an intrinsic part of Iranian culture and its people’s daily lives. Indeed, carpets and rugs are in many cases the most valued possessions, and they are an integral part of an Iranian home. Thus, it is not surprising that current production levels throughout Iran equal those reached prior to the Islamic Revolution of 1979. In fact, rugs are now even produced in areas where weaving was heretofore not practiced. Furthermore, Persian carpets continue to boast very high quality standards and command a very brisk interest in domestic and international markets. While large city workshops were an important factor in the past, much of today’s production is fashioned along cottage industry lines in smaller villages and towns. Persian carpets are traditionally known for their tremendous variety in design, color, size, and weave. Moreover, they are known for the uniqueness of each and every rug produced. Rugs are generally named after the village, town or district where they are woven or collected, or by the weaving tribe in the case of nomadic pieces. Each rug’s particular pattern, palette, and weave are uniquely linked with the indigenous culture, and weaving techniques are specific to an identifiable geographic area or nomadic tribe. Source: Susie Beringer at Texas Christian University. Thank you for your business! We appreciate the many relationships we’ve formed over the last few years. Please update your mailing address and contact information via our general email. Check back to the website & blog frequently for interesting facts.